I like Hardee’s. I’m especially fond of their biscuits, so I come to Hardee’s for breakfast quite often (a few times a week). A few weeks ago, the manager on duty extended an invitation to me to come to Hardee’s on Monday, August 17th, to partake in their 2nd Annual “Making it Happen” tour. Today was the last day of the tour, which visited the last 8 of 66 Hardee’s restaurants in Illinois, Indiana, Kentucky, Missouri and Tennessee. At each location, the tour donated money to hometown charity groups, organizations and individuals. This year, a total of $25,000 was given to individuals and small groups where it has the most direct impact on lives, enabling them to continue ‘making it happen’. In front of the Champaign Hardee's. 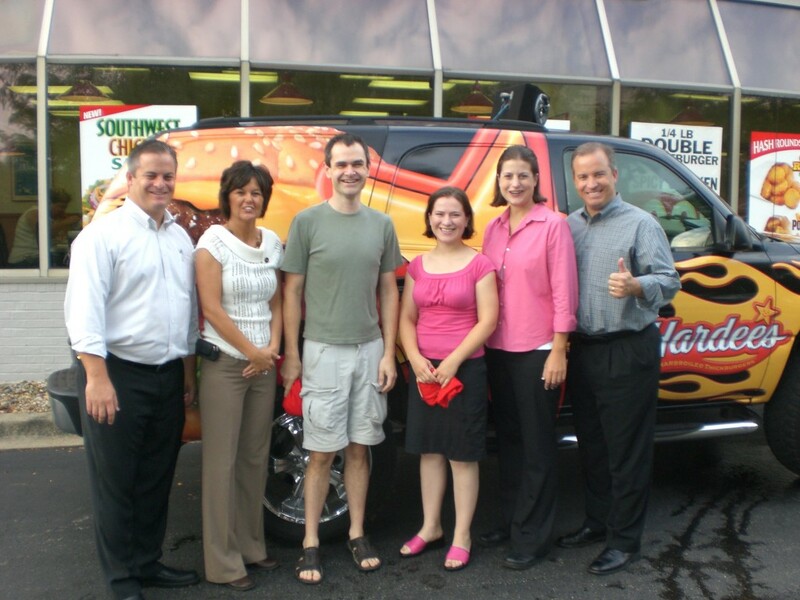 From L to R: Jason LeVecke, Owner; PR lady; Kirby Vandivort, my Webmaster; Me; Margaret LeVecke, CMO; Carl LeVecke, Owner. Carl Karcher’s story is very motivating. From $326 and a food stand at age 17, to 300 restaurants over a 40-year span, Carl epitomized the ‘Making it Happen’ philosophy of this tour. At the same time, he continued to be charitable and help those less fortunate than he. Carl Karcher died on January 11, 2008 from complications of Parkinson’s Disease, just shy of his 91st birthday. If you would like to move to be within walking distance of your favorite restaurant, or for any other reason, let me know and we can make it happen! Next Next post: What will $29,950 buy you in Champaign? How about a foreclosed home with a scary shower? ?